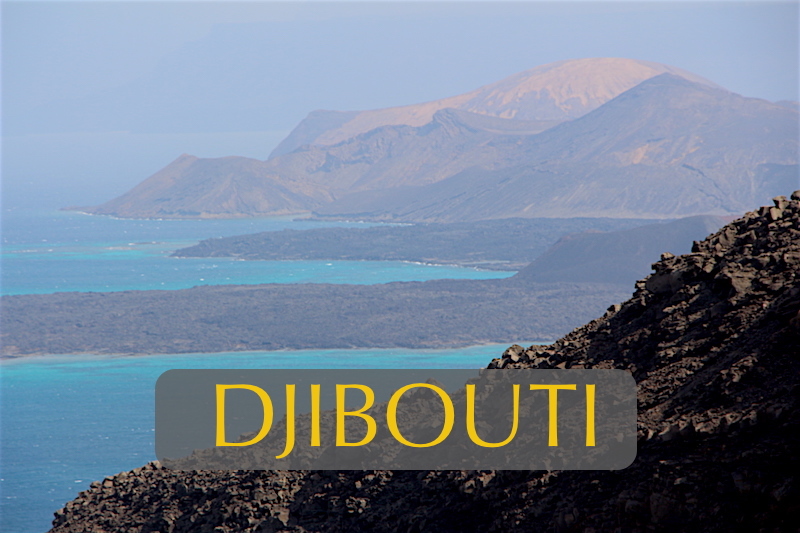 Africa’s smallest country, Djibouti on the Horn of Africa, has one of the most maligned but fascinating landscapes on earth. The great fault lines that are splitting Africa into a new continent and a new sea all converge here before diverging out into the Red Sea and the Gulf of Aden. Few other areas offer students such open textbook illustrations of the great geological forces that shape our planet. In addition to first hand lessons in volcanism and tectonic plate movements, students on this trip will visit the deepest depression on the African continent and explore Lac Assal with the largest salt deposits on earth. Even more unique is Lac Abhe where living organisms – diatoms and bacteria have produced dramatic, towering ‘chimneys’ from along deep lake rift lines that are unlike any other landscape on earth. Lac Abhe is so alien in appearance it was selected as a shooting location for the first Star Wars movie. In addition to the amazing geological lessons Djibouti has to offer, students will explore mangroves on offshore islands in the Gulf of Tadjourah and snorkel over world-class reefs. They will visit settlements that were trade forts in the time of the Pharoahs and take part in an overnight camp and camel caravan with Afar nomads to have a full immersion experience into their way of life. Still off the radar of large-scale tourism, Djibouti offers an educational opportunity unlike any other. Students arriving in Djibouti on Ethiopia Airlines or Kenya Airways on morning flights will be greeted at the airport and transferred to a pier for a 20-minute boat trip to a lodge on Moucha Island. Lunch will be served on arrival and students will have the mid day hours to shower and catch up on some sleep after their long flight. A trip orientation session will happen later in the afternoon followed by time to swim in the sea and learn about mangrove ecology by walking trails on the island. After a delicious dinner, students will have a talk on the geology & natural history of the Horn of Africa. Students will want to be up early to watch the sunrise over the Gulf of Tadjourah before breakfast. Packing up, we board a passenger boat for the 1.5-hour cruise across the Gulf of Tadjourah to Sables Blancs, a beautiful beach of white sand bordering a dazzling coral reef on the edge of the desert. Students will have the full day here for lessons in coral reef ecology as they snorkel over a world-class reef for biodiversity and study marine creatures that they will report on later in the day. Our lodge tonight is right on the beach and we will enjoy a beach barbeque dinner this evening followed by a campfire and group sharing circle under the stars. Today is an extraordinary day for adventure as students enjoy the morning hours swimming and snorkeling before traveling by launch to the ancient city of Tadjourah to see the morning market and learn about the history of this town. The history of the Republic of Djibouti started in Tadjourah in the last part of the 16th century when it was a strong Sultanate like Harar, Zanzibar and other Sultanates of the Muslim World. Touring the waterfront with its Arab dhows, visiting the morning fish market, goat & sheep butchery and spice stalls, students will see a town little changed in centuries. Tadjourah – the town of ‘Seven Mosques’ still retains its Sultanate as a figurehead. A new port being built here may once again bring it to the prominence it once had as a trading center in the ancient world for ivory, incense and slaves from the African interior to the Arab world. 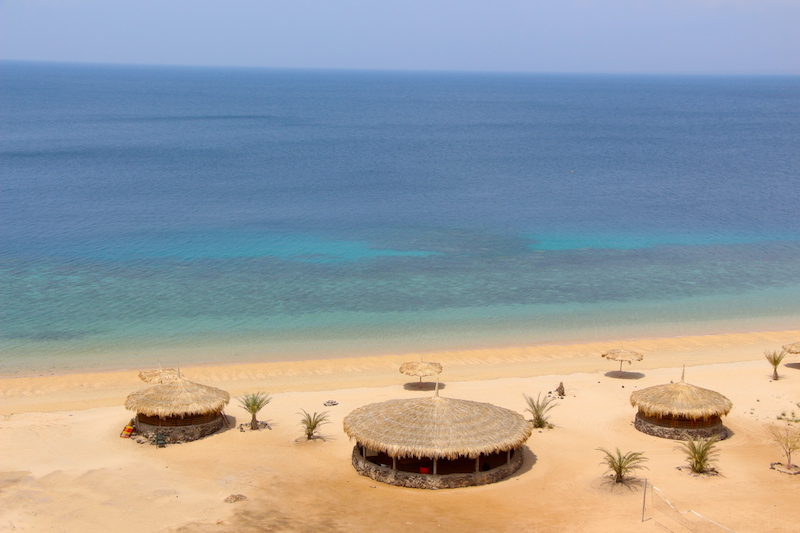 After enjoying a fresh seafood lunch at Le Golfe Restaurant on the edge of Tadjourah, students will embark on a Dromedary Camel caravan along the coast and through the dunes where they will learn to set up a traditional Afar nomad camp for the night. 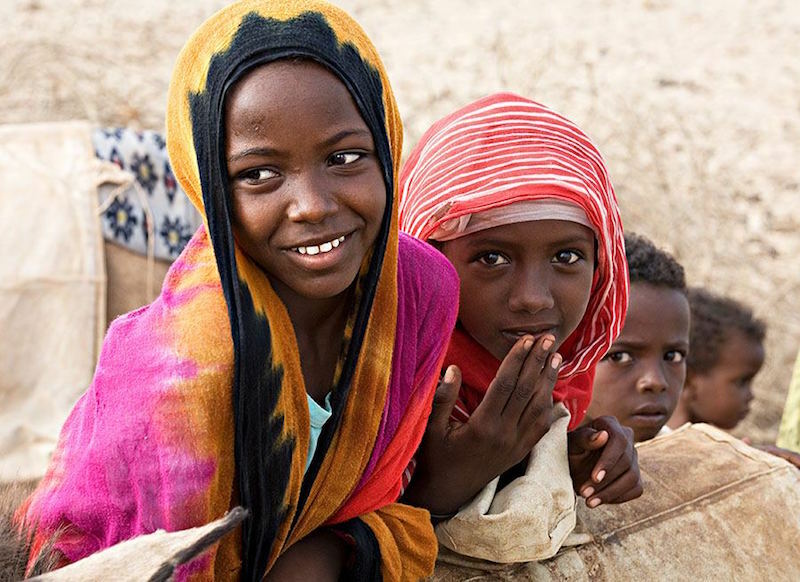 Afar camel herders will become our teachers as international school students learn through immersion the technologies and lifestyles that have allowed the Afar indigenous peoples to survive here in one of the most challenging environments on earth. Once we complete our dome shelter frame and cover it with palm woven mats, students will learn how to cook a traditional nomad meal. With the cool sea breeze coming in off the Gulf of Tadjourah, the beautiful sand dunes surrounding our camp and the highest mountains in Djibouti with the world’s oldest juniper forests forming a majestic backdrop to the west… this will be a camp to never forget. Before bedding down for the night, students will climb the highest dune with a 360-degree view to learn how to identify constellations in the night sky … the same constellations that guided the Arab dhows over the Arabian Seas and camel caravans across the vast deserts of the Horn of Africa. The magic of sunrise in the dunes surrounding our camp is a moment students will be encouraged to experience in quiet solitude. In the cool morning hours after breakfast students can explore miles of wilderness beach and learn about Afar medicinal and food uses of plants as they pass through the desert. 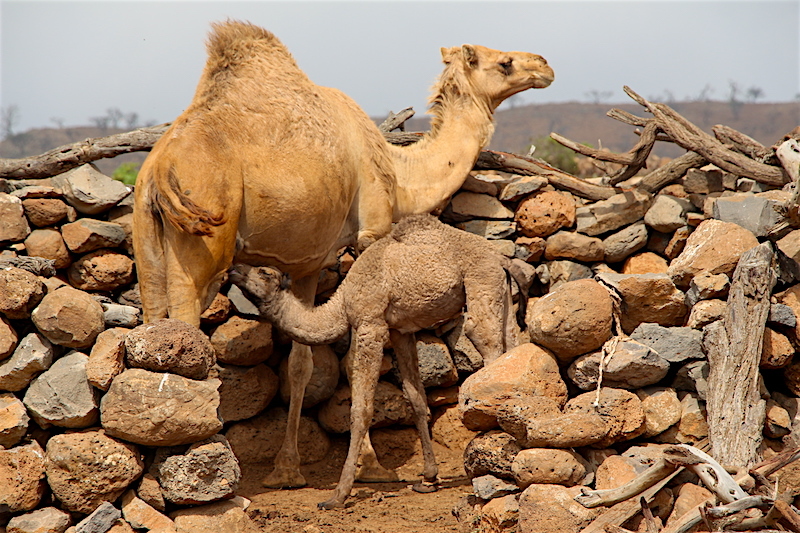 Breaking camp, students will learn how to load up a one- humped camel as we depart by 10:30 am and work our way to the village of Sagallou, the site if an Egyptian fort in the time of the Pharoahs. Here we will board air-con mini vans for the 1-hour drive to the head of the Gulf of Tadjourah and our dramatic campsite overlooking the Devil Islands in the Bay of Kharab. We are now in the heart of a vast volcanic landscape where Djibouti’s last big volcano (Ardoukoba) erupted in November 1978. ‘Ardoukoba’ means ‘flooding’ in the Afar language and students need only look around them to see the massive lava flows and volcanic bombs that covered this landscape during that eruption. After taking some time to settle into our rooms set on a cliff face overlooking the bay, and having a talk about plate tectonics, we will drive 30-minutes further around the bay to a canyon unique in the world. Canyon Adaileh is 700 m deep and resembles a miniature version of the Grand Canyon of the Colorado. Geologically speaking, it is much more significant for this is the triple junction, the intersection of 3 main rifts that are splitting apart the African continent. One rift is an extension of Africa’s Eastern & Western Great Rift Valleys that converge in Djibouti and extends north to form the Red Sea. Another riftcuts through the canyon and extends out to form the Gulf of Aden. On our way to the canyon we will stop along the highway for students to see for themselves the movement of these colossal plates. A split across the highway is perfectly aligned with one of the fault lines and the 2 cm annual movement can be easily measured here. At this point students can stand with one foot securely in Africa and the other on a new continent moving towards Eurasia. 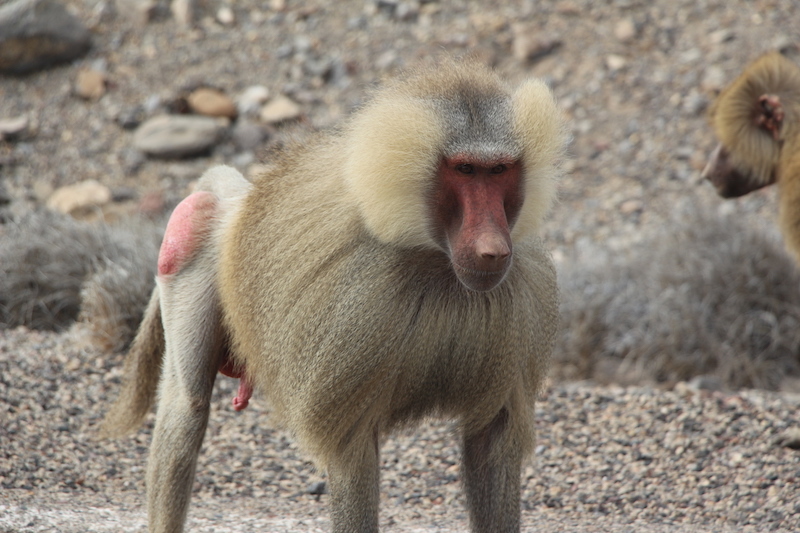 Arriving at the canyon by 3:30 pm, we will set off on a 1.5-hour trek through the canyon and along a valley floor frequented by baboons to a point where we will meet back up with our mini vans. We now drive 20-minutes down to Lac Asaal, the lowest spot in Africa at 155m below sea level located in the Danakil Depression coming into Djibouti from Ethiopia. Lac Assal is surrounded by a huge ‘iceberg’ of salt 62 km₂ in circumference and 80m thick containing up to 2 billion tons of salt. It is the largest reserve of salt on earth and the rights to mine it have recently passed from an American to a Chinese company. Today there is no life in Lac Assal as the concentration of salt is too high (348gr salt/litre), but it was not always so. Students will see evidence of fresh water snail shells in lake deposits from 9,000 years ago when Lac Assal was filled with fresh spring water. There are three theories currently being debated as to how the sodium content of Lac Asaal increased so dramatically that students can discuss this evening after dinner. They may even put forward theories of their own. 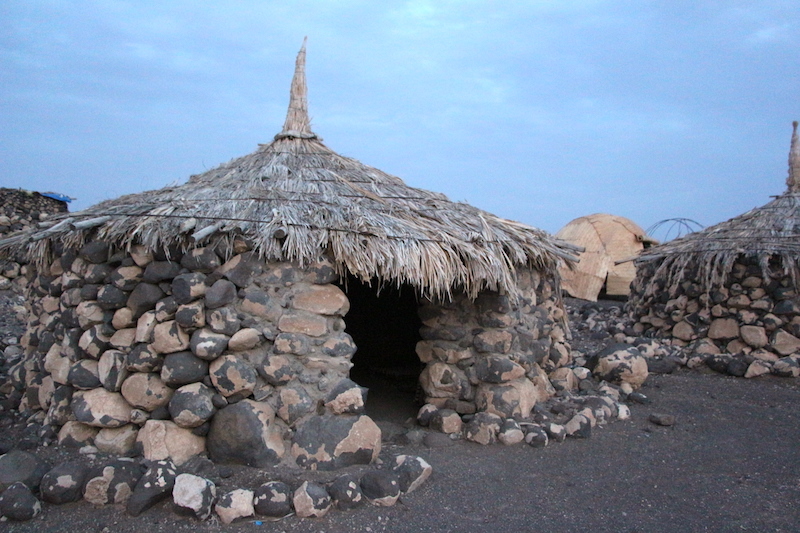 Students will also learn how this massive salt reserve in Afar territory made these nomadic peoples inordinately wealthy. Salt caravans left here for interior Africa laden with a mineral vital to the health of humans and all their livestock. To pay for this commodity, the Afar received gold, incense, ivory and slaves they then sold to Arab traders. At Lac Asaal students can walk out over what appears an ice sheet of salt along the edge of the lake. They will see the salt encrusted skulls of antelope, goats and cows that wandered into the water and perished, and they can witness local Afar peoples still cutting salt for sale to this day. We wake up early this morning and enjoy breakfast as the sun rises over the bay. Today we have the longest hike of the trip and we want to get an early start while the day is still cool. Directly behind our camp is a great volcanic landscape that surpasses in features Hawaii’s Volcanoes National Park. Hiking along an easy grade 8-km track, students will see huge broken lava flows, volcanic ash swept into dune formations, fumaroles still spewing hot air and boiling hot springs. Students can crawl their way through volcanic tunnels and climb to high vantage points that look out over a lunar-like landscape. Returning to our camp by 10:00 am, we have an opportunity to rest, shower and enjoy lunch before driving by mini vans to desert town of Ali-Sabieh. Along the way we will detour off the highway to explore the vast Grand Bara (Big Sea) desert where an ancient dried out lake bed is home to Thompson and Summering Gazelles, frequent whirly wind volcanoes and mirages. The nomadic Issa peoples of Somalia inhabit this arid stretch of land as they have for centuries. Eight thousand year old rock paintings of giraffes, elephant and hyenas tell the story of a time this landscape looked much different than today. Arriving in Ali Sabieh in the late afternoon, students will return to the comforts they are more used to with twin sharing hotel rooms and private baths. A hill beside our hotel compound offers spectacular 360 degree views of the surrounding mountains, desert and Ali-Sabeh, where desert nomads pitch their dome-shaped huts on the edge of the town. Today we transfer from mini vans to land rover jeeps as we set off after breakfast into the desert wilds of Djibouti’s remote southwest. Passing through Dikhil and As-Eyla, we arrive at the remote nomad settlement of Kouta-Bouya where we will take part in a service project at a very poor village school. International students will engage with the local Afar children in creative and fun ways helping them learn a bit of English as well as giving them a bigger picture of the outside world. In the late afternoon we arrive at Lac Abhe and the famous ‘chimneys’ that make this location such a spectacular sight at sunset and sunrise. Lac Abhe was historically fed by underground rivers from Lac Awash in Ethiopia, but much of its flow was cut off when dams were built to divert water for cotton production in the 1950’s. The lake has steadily dropped since that time, revealing an otherworldly landscape that is as much a product of biological forces as geological ones. The change in the lake has seen a disappearance of hippos and crocodiles but the flourishing of a new micro life that now supports flocks of Pink Flamingos. After viewing the sunset we will settle into our camp on a ridge overlooking the ‘chimneys’ for a good dinner and a rare opportunity to learn tribal dancing with local Afar children. It is not every day international students get to shake their booty in Djibouti. Our accommodations this night will be traditional Afar nomadic tent huts, or high elevation round rock dwellings where students will sleep on cots with foam mattresses. Those that choose can pull their bed outside to sleep under a firmament of stars appearing close enough to reach out and touch. Students are likely to hear hyenas and jackals calling throughout the night as these predators try to figure out ways to steal a goat or sheep from the overnight rock bunkers the Afar nomads build to protect their flocks. Everyone will rise early to watch the sun rise over the ‘chimneys’ and stretch our legs with a 45-minute hike down to the lakeshore to see Pink Flamingoes feeding before wereturn to camp to enjoy our breakfast. 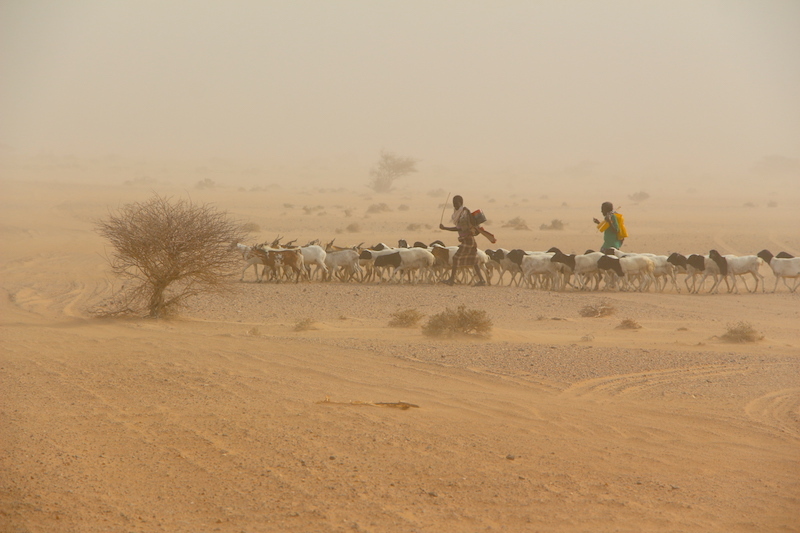 On the return hike from the lake, we will encounter Afar children taking their sheep and goats out across the desert for what meager pasture there is and to guard over them from attacks by jackals and hyenas. 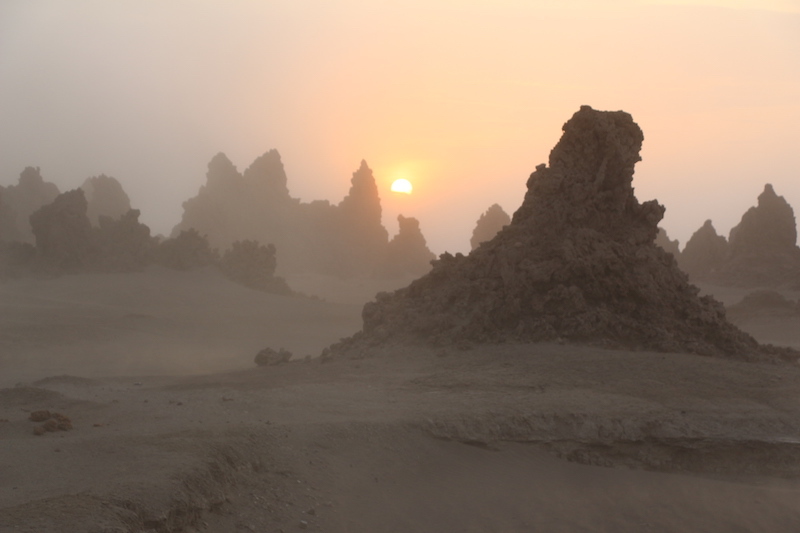 Later we will drive past the tallest of the ‘chimneys’ – the location where Star Wars was filmed in the 1960’s. A nearby spring is a favorite feeding area for wart hogs, gazelle, wild burrows, and Egyptian geese. Our jeep journey back through the vast desert will take 2-3 hours before we reach the French colonial town of Dikhil where we will stop for lunch. It’s another 2-hour drive from Dikhil to Djibouti over a new highway where we will check into the comforts of a 3-star hotel, clean up and enjoy a delicious closing dinner in the old French quarter. A closing ceremony this evening will conclude our Djibouti adventure with the awarding of trip certificates and a candle-sharing circle where each student can reflect back on their favorite memories. After breakfast at our hotel, students will be transferred the short distance to Djibouti International Airport to check in for the return flight home.